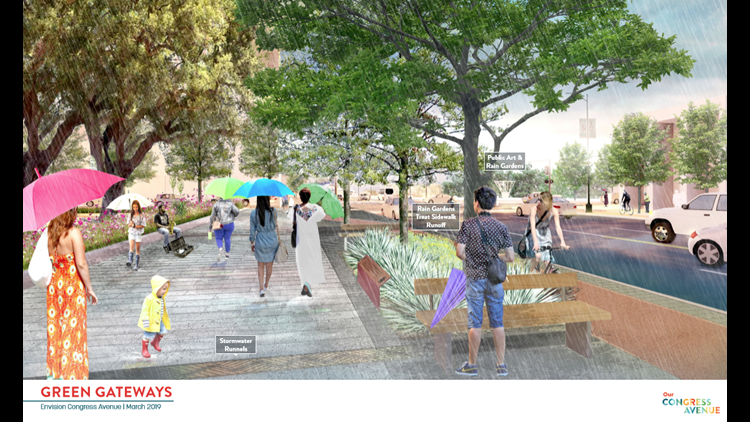 In partnership with the Downtown Austin Alliance, the city has developed a design concept from Riverside Drive to the Capitol along Congress Avenue. 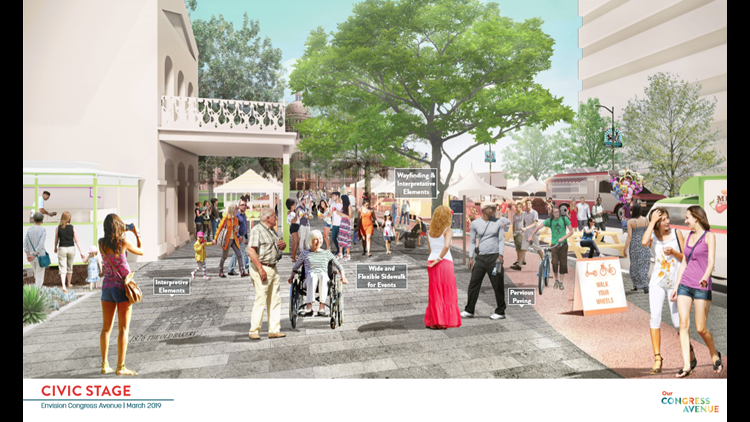 AUSTIN, Texas — The City of Austin has partnered with the Downtown Austin Alliance to hold its fourth open house for the "Our Congress Avenue" project. 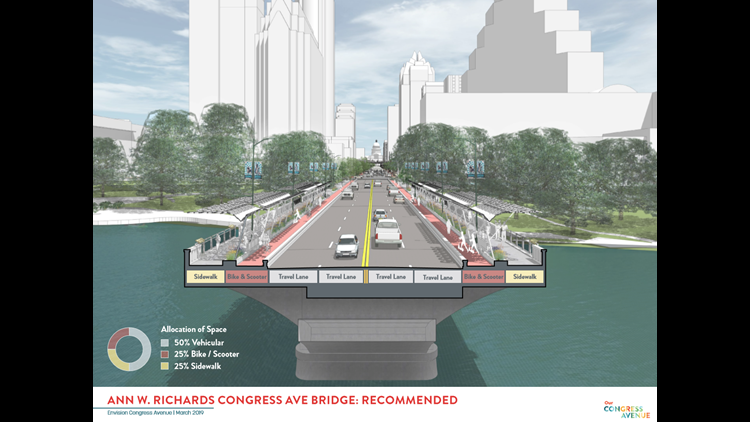 The team handling project has developed designs for Congress Avenue from Riverside Drive to the Capitol. After taking in feedback from the community, a recommended concept has been developed. The draft recommendation shows improvements focused on more pedestrian spaces, protected bicycle/scooter lanes and various modifications to vehicle lanes. The proposed changes reduce car lanes on Congress Ave. by at least one lane and reduce some street parking. Instead, it wants to add a lane for bikes and scooters, along with larger sidewalks. On the Congress Ave. Bridge, a barrier would separate bikes and scooters. "That also protects the pedestrians better than they are now," David Taylor, project manager with the city's public works departments, said. "Where they can currently take one bad step and be in front of a car going 45 miles an hour." The city said there is no way to expand the avenue's right of way or bridge. That's one of the reasons it's not adding car lanes. "We see a future in which the traffic on Congress Avenue moves in various modes," Taylor said. "Pedestrians can already travel faster than cars can during rush hour in the evening." 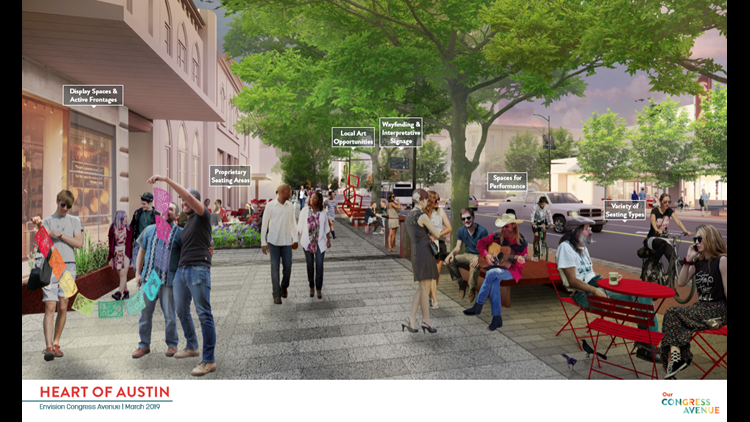 Proposed renderings for Congress Avenue. KVUE talked to a couple storefront retailers: Kruger's Diamond Jewelers and Consuela's, a handbag business. David Kruger, the owner of the jewelry store, said he loves being on Congress Avenue, but the proposed changes would hurt business. "If 10 people walk into my store," he said. "I get 12 complaints about parking." However, Nina Dominguez, the store manager of Consuela's, said more pedestrian walkways could bring more people in. "We love where we are, and if there's opportunity get more people down on this side of Congress, we would absolutely welcome that," Dominguez said. Kruger said the reality is, people are driving downtown. "If you make it that much more difficult on them to have driven here to find parking just to travel around downtown, then guess what? They're not going to come downtown anymore," Kruger said. These changes would cost about $70 million. Construction still needs to be funded and plans approved by city council. That approval could be early this summer. The Tuesday morning open house to present the plans ran from 7:15 a.m. to 9 a.m. with a second event held from 5 p.m. to 7 p.m.